If all you’re thinking is jelly, think again. It’s an ancient rite of late summer, dating back to long before the arrival of Europeans in the Americas. In a good year, typically around the first week of September, on coastal plains and dunes on Martha’s Vineyard and throughout New England, dozens of small, tart fruits dangle from the branches of the beach plum plant and are gathered by those who know a good thing when they taste it and are lucky enough to know a good patch for picking. The size of large marbles, the wild plums have a bluish-purple skin like their domesticated cousins, a single pit, and a reddish tart and tangy flesh. 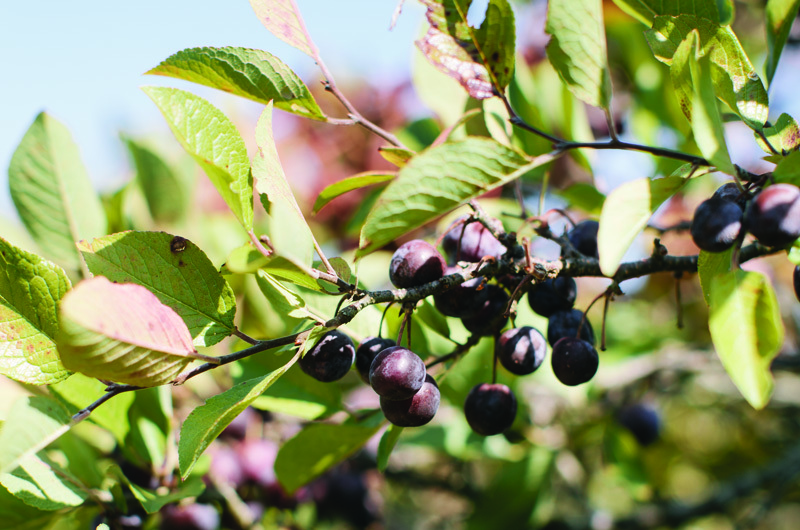 “Beach plums are a resource that’s been around for thousands of years,” she added. “Historically, with the tribe, it was just part of the mix of food,” along with other wild fruit for the picking: grapes, strawberries, cranberries, blueberries, and blackberries. Beach plums are a bit like cranberries in terms of eating: not many people eat them straight off the bush. There’s a hint of sweetness and a lot of tartness, though the flavor varies from bush to bush. 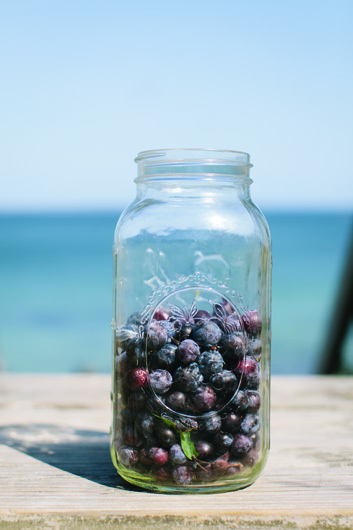 Because of this, the most popular form of consumption is beach plum jam or jelly, sold everywhere from Morning Glory Farm to the West Tisbury Farmers’ Market, and given as a handcrafted gift. At its best it can be a beautiful translucent magenta with irresistible flavor, reminiscent of cranberry or pomegranate, that livens the palate. And that’s about all I thought about beach plums and their use until I visited longtime Islander Paul Jackson one year to see his famous vegetable garden. Before giving us the outside tour, we waited in the kitchen while he strained the juice from the pounds and pounds of beach plums he had just picked from “his spot” the day before. Like many Vineyarders, he picks the berries at the peak of ripeness – anywhere from late August until mid-September – and processes and freezes the juice until winter when he has time to make the jam. For me, a light bulb went off: beach plum juice, like wine, citrus, or cherry juice, could be very useful in the kitchen for sauces, syrups, ice cream, even cocktails. It’s also when I started freezing both the juice and whole beach plums to pluck from the freezer for use during the year. One year, we gave some juice to chef Albert Lattanzi to create something for the Living Local Harvest Festival, held each October at the Agricultural Hall. He came back with homemade vanilla ice cream with beach plum swirl, both gorgeous to look at and delicious. Look for the showy white blossoms in spring, and return in September to gather the wild fruit. What else could be done with beach plums, free for the picking along our shores? I wanted to find out more. Last year, I picked, washed, and packed eight bags full and dropped them off to five Island chefs. Their instructions were simple: make something besides jam. I’ve already enjoyed the warm popovers served with a luscious beach plum curd, created by Jenna Sprafkin, head chef at the Chilmark Tavern. Beach plums are good for your health, loaded with vitamins A, C, and B, and about five times the mineral content of cranberries. They also have a high pectin content, a substance scientists now believe can reduce levels of cholesterol in the blood. Christian Thornton and his wife, Greer, have owned and operated Atria in Edgartown for sixteen years. Atria features locally sourced products whenever possible. This is Jenna Sprafkin’s second year as head chef at the Chilmark Tavern. Just prior to coming to the Vineyard, she worked for a number of years at Primo, a top farm/restaurant in Rockland, Maine. For many years Albert was the chef/owner of Lattanzi’s Restaurant in Edgartown. Food Challenge events with Billy Manson, most recently in Italy.